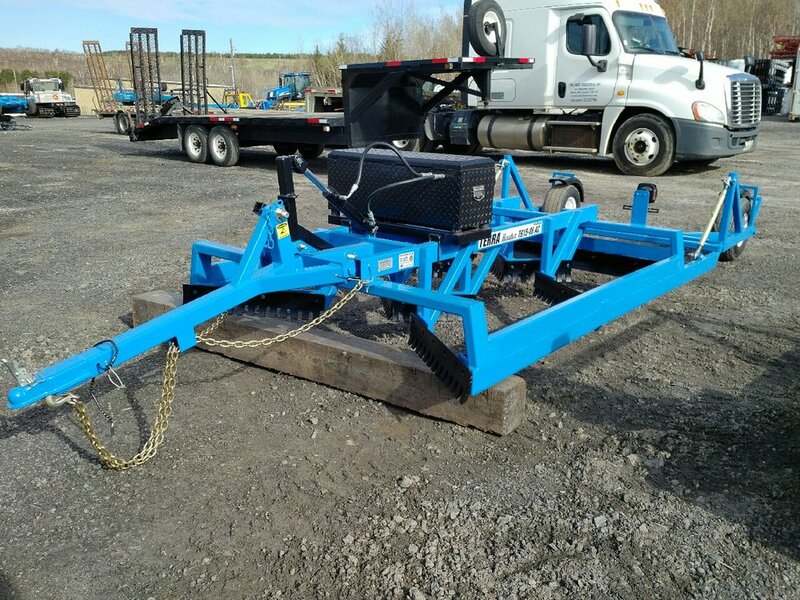 Terra Master Terrain Grader — The Shop Industrial inc.
Based on the industry leading design of The Shop Industrial’s Mogul Master Snowmobile Trail Groomer the Terra Master ULTG has been engineered to grade gravel, slag, sand, loam and dirt. 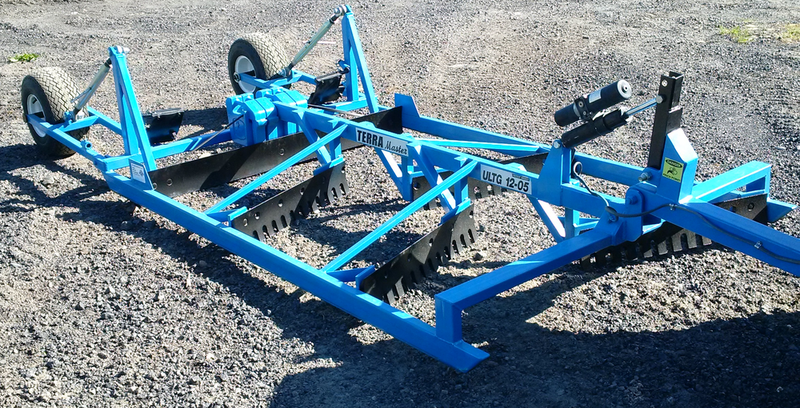 Incorporating four angled, serrated grader blades with a rear straight grader blade the Terra Master effectively eliminates bumps and washboard and with its long plaining length a smooth and very flat surface finish is achieved. The Terra Master’s grading attitude is easily set with the manual rear wheel “Top Link” adjusters and because these are independently adjustable the Terra Master can even be set up to grade a crown on a road surface. Designed light yet rugged and aggressive, the ULTG can be pulled with a 4-wheel drive ATV or similar vehicle. The cutting depth and load of the Terra Master is easily controlled by the operator with a Handle Bar Control Switch which activates an Electric Actuator mounted between the hitch and the main frame of the grader. Typical uses for the Terra Master include ATV/dirt bike trails, bicycle paths, golf course cart paths, walking paths, cottage roads, boat launches, parking lots, driveways, landscaping, beaches, horse tracks, air strips, paved road shoulders or any application where a smooth flat finish to the terrain is required. Terra Master terrain graders provide an affordable alternative to high cost conventional grading equipment and in many applications provide solutions to grading that have never before been possible. The Terra Master XLTG has been engineered to grade gravel, slag, sand, loam and dirt. 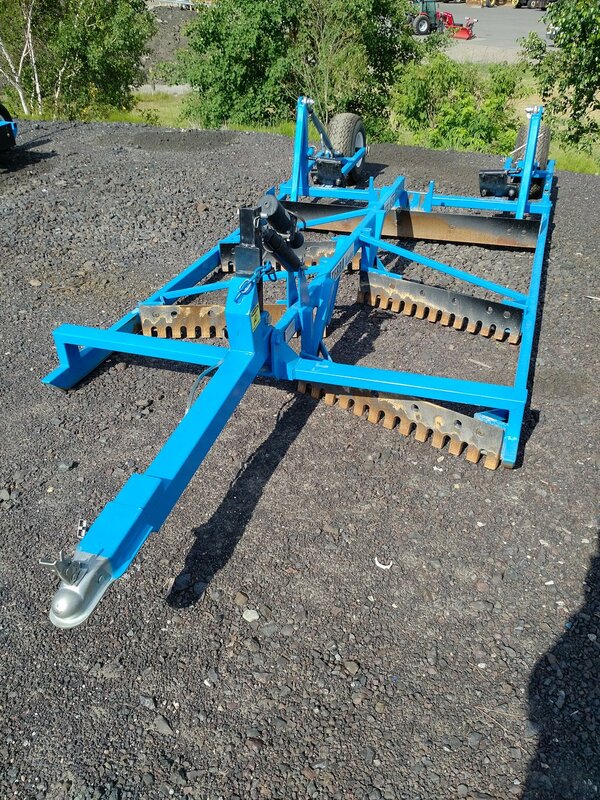 Available in 6 foot or 8 foot wide models incorporating six angled, serrated grader blades with a rear straight grader blade the Terra Master effectively eliminates bumps and washboard and with its long planing length a smooth and very flat surface finish is achieved. The Terra Master’s grading attitude is easily set with the manual rear wheel “Top Link” adjusters and because these are independently adjustable the Terra Master can even be set up to grade a crown on a road surface. Designed light yet rugged and aggressive, the XLTG can be pulled with a 2 or 4 wheel drive pick up, tractor or yard fork truck. The cutting depth and load of the Terra Master is easily controlled by the operator with a cab mounted control switch which activates an Electric Actuator mounted between the hitch and the main frame of the grader. An optional hydraulic actuator is also available. Equipped with trailer lights and safety chains the XLTG can be moved from area to area at posted highway speeds simply by engaging the standard “Actuator Lock-Out”. Typical uses for the Terra Master include cottage roads, boat launches, parking lots, driveways, landscaping, beaches, horse tracks, air strips, paved road shoulders or any application where a smooth flat finish to the terrain is required. Terra Master terrain graders provide an affordable alternative to high cost conventional grading equipment and in many applications provide solutions to grading that have never before been possible.